This little study by Nielson doesn’t actually say “vivacious,” but it’s implied — right there in the headline. 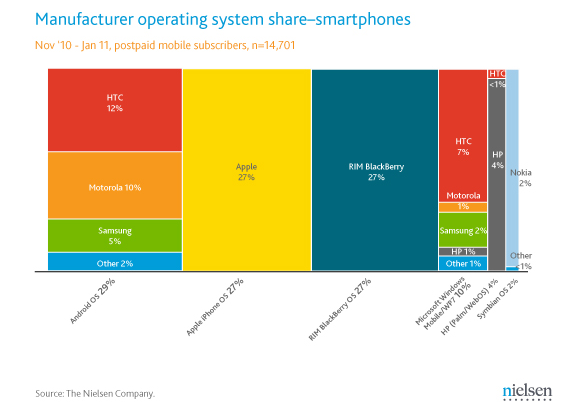 The study is just an exercise in statistics and a look at the smartphone market, but it’s always worth taking a look and speculating based on the big bottom-line numbers like total market share. These two attractive charts detail the distribution of OSes and manufacturers among smartphone owners, which, it should be noted, make up only about 25% (Update: Nielson actually says 34%, comScore says lower, around 27%, my estimate was low) of the mobile-using population, in the US at least. The information is through January of this year, so it’s quite current. So who’s winning? Everybody, it looks like. It really is a dead heat at the moment, but like Jell-O, there’s always room for analysis. As always, Apple and RIM have a major inertial advantage in being both the manufacturer and OS provider. They have absolute control and consumers trust that. On the other hand, they are unable to cast off their skin and rebrand at will, as Motorola and HTC have done. This stolidity and inflexibility means that their brand doesn’t apply as much to the younger generation, and although the stats right now show only a very modest lead in the 18-24 demographic, it’s significant in that Android-related brands are not showing a weakness among the young. We all know that Android has nowhere to go but up, considering that it has only barely begun to crack the feature phone market, which Apple and RIM aren’t really capable of attacking without damaging their brand. When Android starts to crack the “my first phone” barrier (perhaps with a simplifying skin cooked up by the likes of LG or Samsung), i.e. the pre-18 demographic, you better believe that age gap is going to widen. 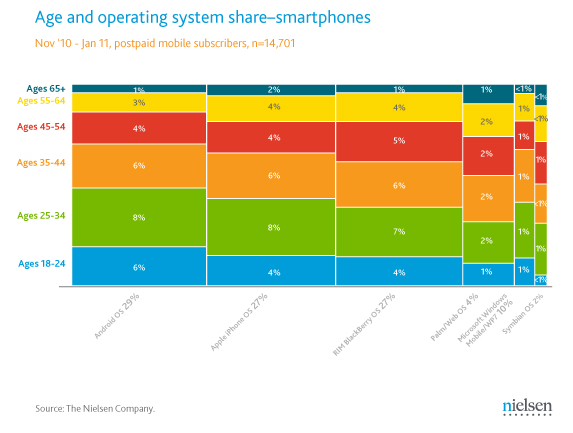 On the other hand, it’s clearly a struggle for Android handset manufacturers to maintain their share, since they’re battling on multiple fronts. It’s fair to say that right now they’re fighting over scraps, dividing between them an equivalent share of the market as is owned solely by Apple or RIM, but establishing a pecking order early on means that once that share starts to grow, eventually a portion of the Android market may outsize the totality of the iOS market. That’s a long ways out, though, and one must never underestimate the competition. After all, the iPad is acting as a bulwark and gateway gadget, and of course Apple computers are far more popular in that young demographic, so it’s still anybody’s game. These minor differences will grow, though, and while it’s a battle of inches right now, it’s still early in the race, if indeed the race can be said to have an end at all.